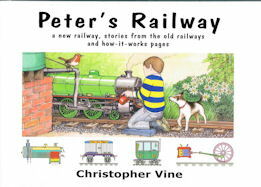 Peter’s Railway is the story about a young boy who lives with his family in a cottage at the edge of his Grandpa’s farm. To make visiting each other more fun, Peter and Grandpa build a miniature steam railway. They have adventures along the way and use all sorts of machines and tools to help them in their great building project. When they are having a rest, Grandpa tells Peter some amazing-but-true stories from the old times on the railways. The books are illustrated with beautiful pictures by the railway artist, John Wardle. The story ends with the grand opening ceremony and the first steam train running the full length of the scenic railway: through the fields, woods and alongside the river. Many technical ideas are explored, with the steam engine and railway being explained in special pages at the ends of chapters.